Moretsu Pirates 16 ~ did you forget that we’re pirates? 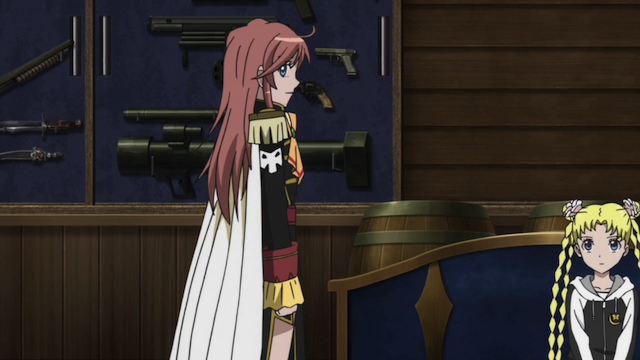 Captain Marika Katou prepares to have a difficult conversation in the gun room. Episode 16 of Mouretsu Pirates (Bodacious Space Pirates) continues the pattern established in this series. The earlier episodes built up to this episode in which the Yacht club fills in for the hospitalized crew of the pirate ship Bentenmaru, but when the job is over, an emergency dealing with a possible traitor in their midst, and a kidnapping are exposed. 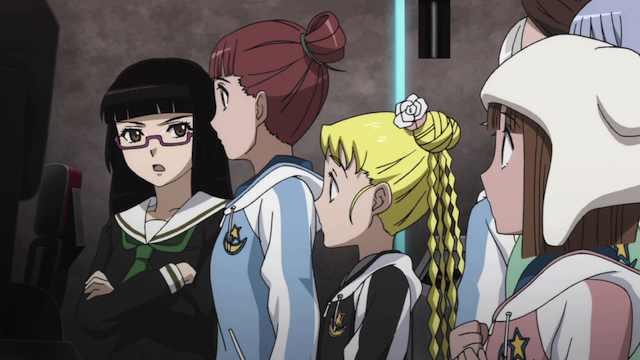 Chiaki Kurihara tries to get the Hakuhou Girls Academy Yacht club members to take pirating seriously. The first half of the episode was basically about transitioning the girls from the mindset of a fun Yacht club outing to the serious matter of pirating — with limited success. 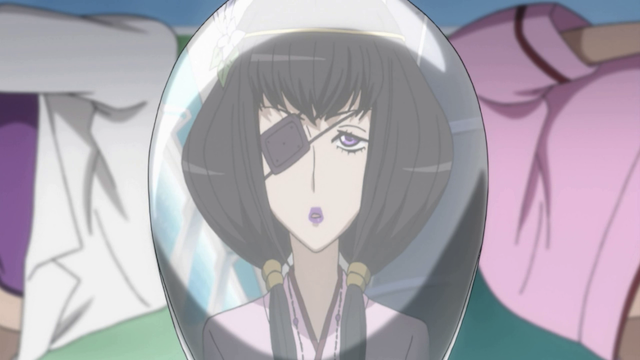 I really appreciated Chiaki’s serious nature in these scenes, probably because I see a bit of myself in her. I’ve been at work parties and had people berate me for “talking shop” when everyone else wants to lighten up. Even during the work day I can see that some people don’t necessarily want to have a conversation with me, because I would rather push ahead on some problem than chat about trivialities. Chiaki wants to do a good job. She does care about other people in her own way, but she shows it by taking things seriously. When she tells Marika that the bed assignments for the crew still need to be drawn up, she gets “thanked” by having her food spiked with super-hot pepper. Ai Hoshimiya. Well, I have seen more intimidating pirates. This show’s non-traditional concept of pirate really comes into play here. Despite some bumps, the Yacht club manages of pull off an “attack” on the Princess Apricot. It probably was best that the regular crew couldn’t watch what happened. I also fear they will have to put up with some embarrassing stories being told about the Bentenmaru’s new branding. Yacht club president, Lynn Lambretta. She is hiding a dark secret. Occasionally during this episode they dropped hints that something is going on with Lynn. Could Lynn possibly be a spy? Is she working for a rival pirate gang? Marika doesn’t want to think ill of her friend, but when Grunhilde comes forth with her suspicions, the captain is forced to act. 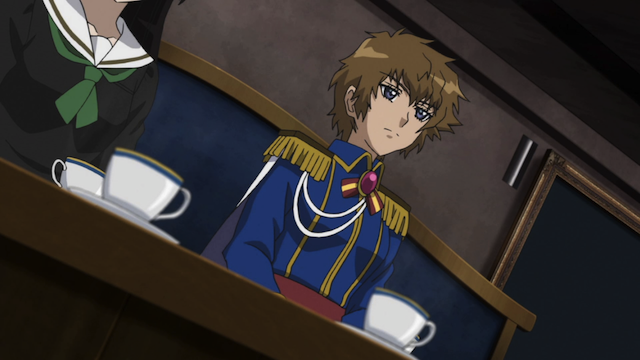 She sits Lynn down with her trusted advisors (Chiaki, Gruier, and Grunhilde), and then asks her what is going on. Lynn’s response sets up the climax of this arc. She asks that the Bentenmaru kidnap Jenny Doolittle, the previous president of the Hakuhou Girls Academy Yacht club. It’s kind of funny how clear it is that this series was adapted from novels. Each arc builds gradually for three episodes as the characters are put into place for the climax, which is spread over two episodes. This has then been followed by an episode that was basically an epilogue. If this six episode structure holds, the next two episodes are the climax of the third arc. Luca, pirate ship navigator and psychic. You could certainly make a case that it was naive of Marika to simply call Lynn out on this. After all, if she really was up to something nefarious, would she admit it? 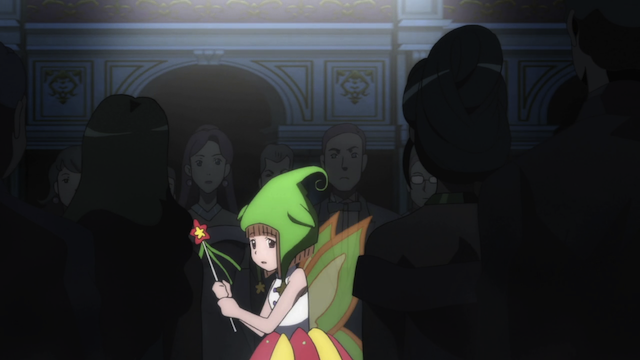 But I think it’s a case of Marika trusting her instincts. She knows these people well. She’s even been through combat with them on the Odette II. If Marika isn’t a good judge of character, she’ll never be a successful captain. And did you notice that there was one stateroom that had four beds and five occupants? And one of those occupants was seen chasing the other through a locker room in an earlier episode. Not that I’m suggesting anything untoward, of course. Heh. Heh-heh. They probably were going for the “judge of character” angle. Arguably she is doing something nefarious, since she asks them to kidnap someone. It probably won’t be for a bad reason, but kidnapping is still illegal. Funny thing is Marika was given 3 choices earlier, and now she is already working on the second. I wonder if she will work her way around to the 3rd by the arc’s end. By “something nefarious,” I meant againt the Bentenmaru and its crew. Since this doesn’t seem to be the kind of show that goes to Dark Places, I’m pretty sure that what may start out as a “kidnapping” will morph into something less serious by the end, but it’s going to be very interesting to see how they manage that. And that’s an interesting point about the “three choices.” This show’s good about weaving seemingly off-hand comments and incidents back into the story at a later point, so that’s not entirely unlikely. I think you are right. This show is pre-disposed against going to dark places. Though it isn’t really a comedy, the intention was probably for it to be fun. As to the kidnapping, I’m actually glad that Jenny is getting back into the story. There are a lot of characters in this show — largely because of the yacht club — and Jenny is one of the ones that actually had some filling out. Having a story about her will be more satisfying than adding yet another character at this point. I’ve decided Marika needs Chiaki, in the sense that she helps ground Marika and backs her up when Marika’s attention ‘drifts’ or she wanders into what for her are uncharted waters. I also get the impression Chiaki understands Marika better than anyone else other than perhaps her mother. I would have gone with a more traditional look as well, but, then again, I’m not a teenage girl. Chiaki is great. She is smart, and takes the job seriously. I don’t think she is available to become a permanent member of Marika’s crew, because she is destined for the Barbarossa, but if she were, Marika could do nothing better than snatching her up.